No worries, this is just a great shot by Johan Halleröd using Pulldownit, he kindly explains many details here. 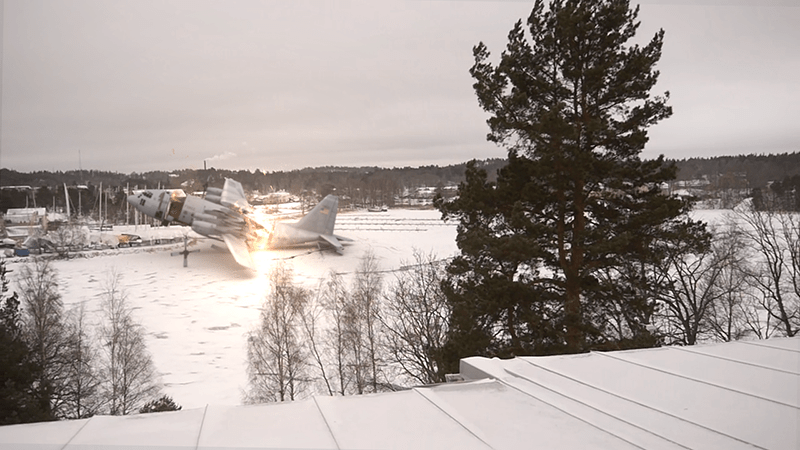 First off – I am not that particularly fond of flying due to an incident when I was young, so analyzing myself this might very well have been a plain therapy-thing. But the major reason for spending three weeks on a non-profit 3D project with this magic plug-in I had never before heard of, is actually because of a friend of mine. I had made an animation with another plane passing over the same bay. I simply let this plane blow up in a burst of smoke and flames…he was not the least impressed claiming he was missing debris. 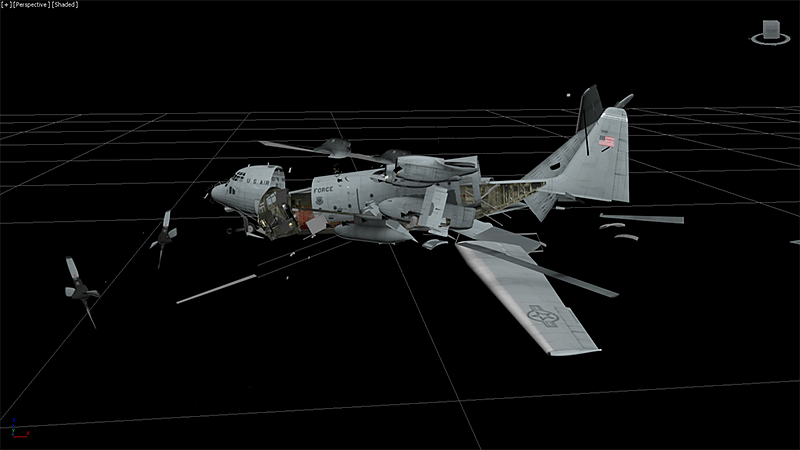 The plane model I decided to use for this project is a Hercules US C 130. I didn`t model it myself but I chose it because of it`s monstrous appearance. 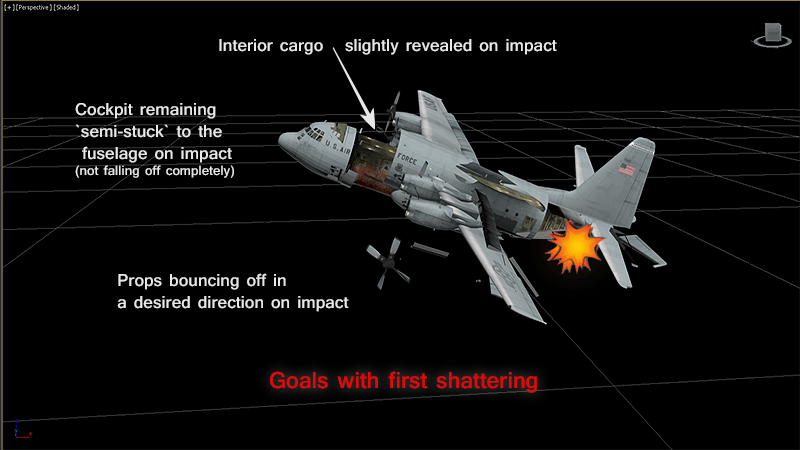 I wanted the impact to feel heavy and serious thus it`s more relevant to use a Hercules than a Cessna. It`s also prop-driven which adds interesting fractions on impact. 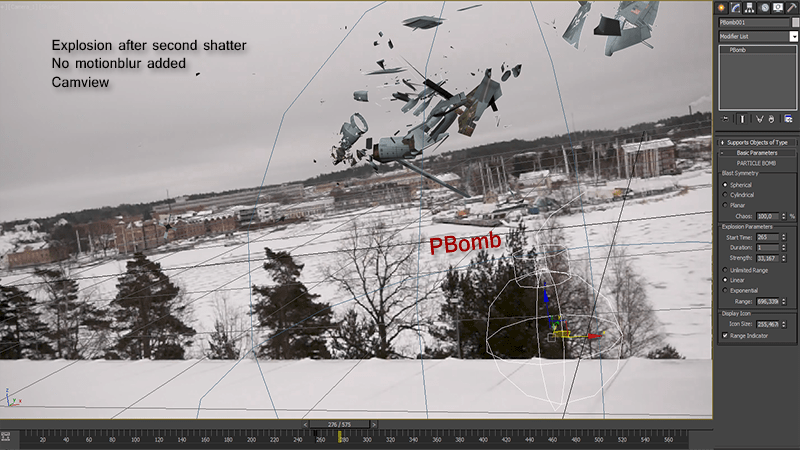 The mesh was then fragmented part by part using the `Uniform Shatter` and `Wood Splinters` in Shatter tool of Pulldownit, (wings, body, interior) to make the impact look right. It`s unbelievably tempting to use Pdi for completely atomizing the poor Hercules-thing as it plunges to the ground, but I got a grip on myself letting the cockpit and the wings maintain close to intact and preserving the interior cargo so there would be something left to blow up after crashing. The falldown-process was done in a perhaps unorthodox way by placing the plane out of frame and then using the `Initial velocity` x-parameter in Pdi to force the plane horizontally, the gravity to make it fall down on the right spot and the `Initial Spin`-parameters for banking and pitching slightly. For fine-tuning the fragments upon impact and make them behave as I wanted, I adjusted the `Hardness` and `Clusterize` parameters ; notice the props bouncing off on the ice, pretty neat I think. I also found the `Linear damping` and `Friction` parameters of PDi very handy to make the plane drop and stop spot on. Now, to make the plane explode with the right chunks taking off in the right directions and with the right dimensions (more and smaller pieces), I had to re-shatter parts of the model. 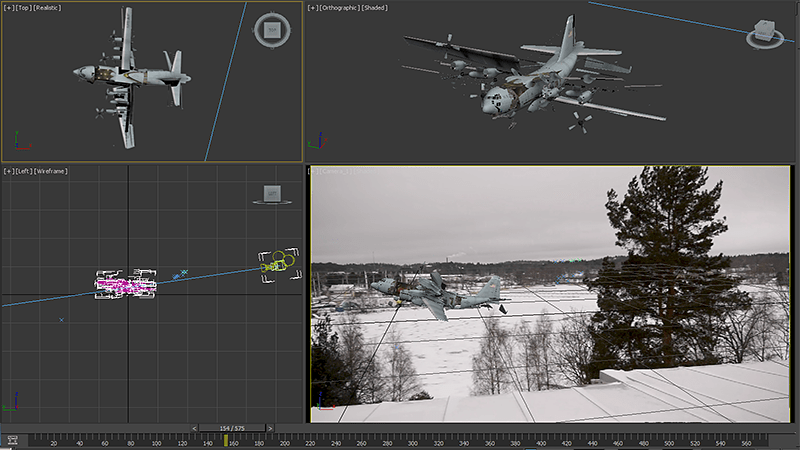 I saved the 3DMax-project as “Part 2” and at the plane`s initial position thoroughly I re-shattered the bits and pieces I wanted to trigger the explosion, i.e cockpit, wings, fuselage and a few more. 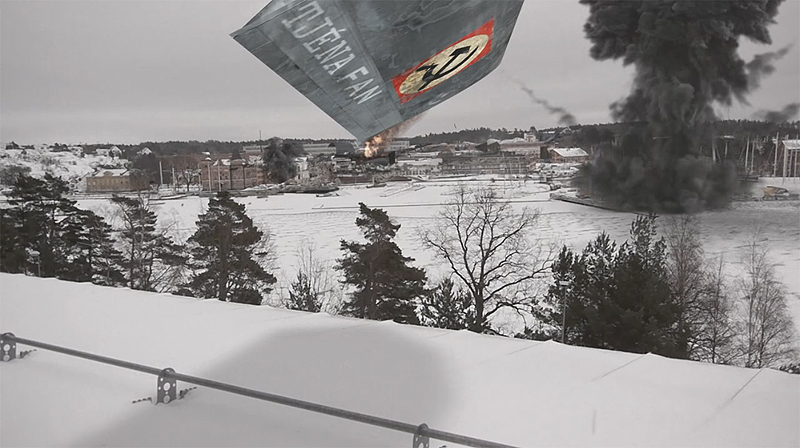 Then I placed a spherical PBomb , making sure were affected by force fields in Pdi, slightly to the left of the fuselage midpoint, trying to make the plane`s front parts take off towards the habitation, the houses in the back, and after some tweaking they did. This “part 2”-clip was carefully edited on to the impact-part in After Effects. For the final wings wing-thud, I simply manually animated a separate tail wing not affected by the force field. I had even planned for it when filming the clean-plate by chicken-ducking the camera as the wing comes towards me. 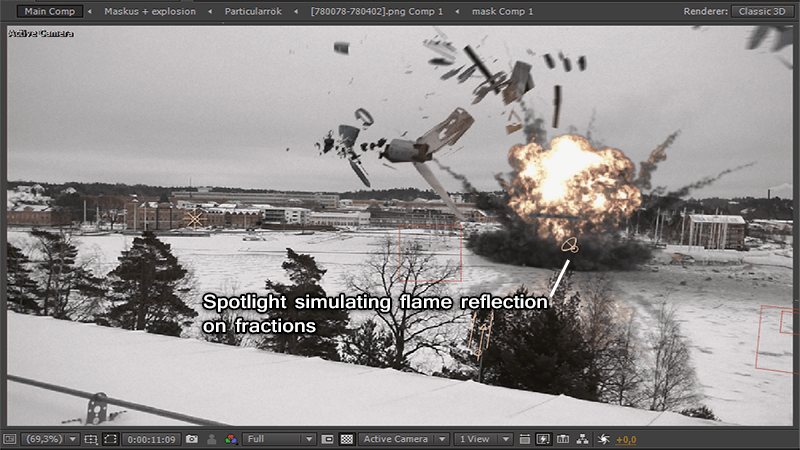 The final compositing was made in After Effects, adding stock shots of rock debris, dust waves, sparks, flames, explosions and also some basic 3d smoke from Particular. As usual, adding real elements ie. stock footage, to a CGI always adds realism and I used a total of 15 different shots but for some reason the humongous apocalypse-bomb at the end…is CGI. Don`t ask me why. 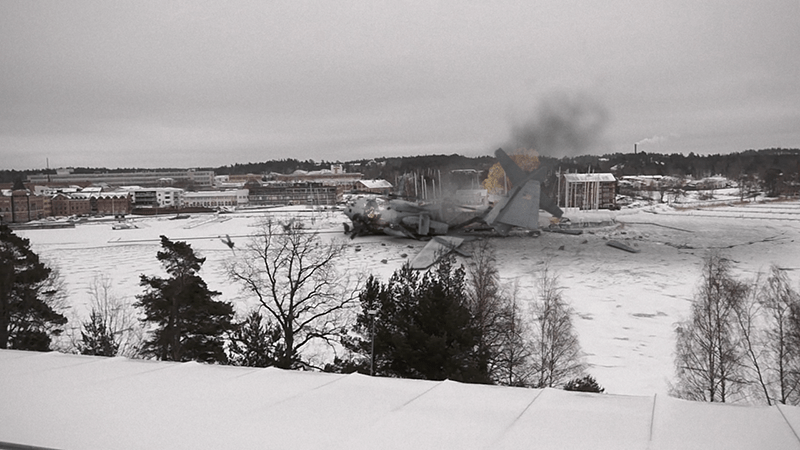 As a matter of fact, I am not too proud of the first frames of the explosion when plane parts exit the flame, I just couldn`t get it right…or maybe I was hungry and didn`t care. 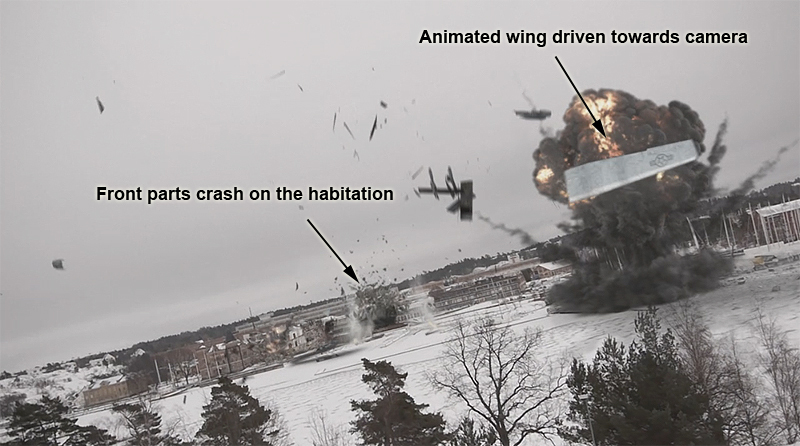 But if you take a look at the first impact of the crash when the rear cracks open, there are plenty of things going on in terms of stock footage which adds realism; steam pours out from the cargo and bundles of 100 dollar bills ( I guess), falls out of the wreck, pretty real to me. To make CGI and live footage work convincing together, they need to get married. First and foremost you want a rock solid 3D-track, this became a problem for me since I was using a shaky hand camera. I used “Boujou” that was installed on the computer I worked on. Second; as mentioned, real world stock footage. Delicately adding authentic smoke, fire, debris and what not, tends to fade the boundaries between real and binary world. So does final grading. The conductor of this Hercules-symphony is clearly Pulldownit! I had no experience of using it before, but as soon as I started experimenting and tweaking the settings, I found it very intuitive. The mission itself was pretty basic: You have your model, now make it fall down and break apart. The trick lies in selling the shot without people reflecting on the technique behind it, and that`s what makes Pulldownit so brilliant – it`s easy to master, you can get stunning results with very good dynamics and I have only just scratched the surface.